The sample measurement for the low buffer capacity/low conductivity liquid such as pure water, cleaning solution for semiconductors, boiler water, tap water, groundwater, river water and precipitation is extremely difficult to perform. The pH indication because unstable or there is no reproducibility in the measurement..
Because the pH buffer capacity of the sample is extremely low, the response to the pH of pH–response glass membrane many become slower. For the same reason, the contamination of minor constituents (such as measuring containers, constituents in the air ) may affect the pH of the sample. At the liquid junction of the reference electrode, the liquid junction potential or the streaming potential may tend to occur. The internal solution to be lost from the reference electrode may affect the pH. To solve these problems as much as possible and make more accurate measurement, the following methods are effective. Prepare a measuring container which has the flow system as shown in the figure. Use the glass electrode, the reference electrode (sleeve type or double junction type), the temperature compensation electrode. Perform the measurement by setting the whole cell in the shield box. Place the reference electrode so as to locate in the downstream in the sample flow. Stopper the sample bath securely to perform the nitrogen bubbling. Because it tales a long time to respond, wait until the indication value becomes stable. Use the glass electrode, the reference electrode (double junction type), the temperature compensation electrode. 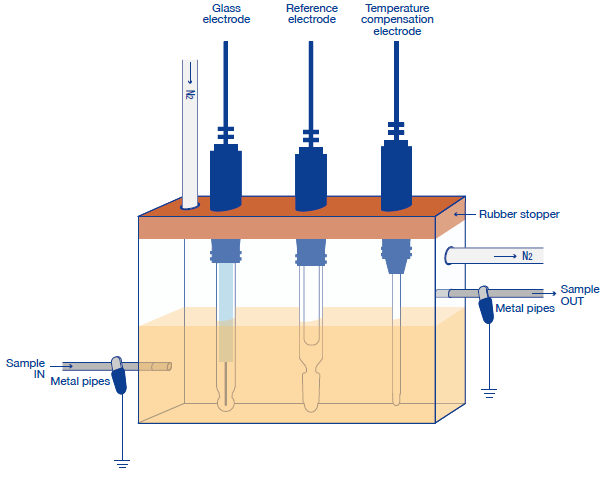 For reducing the influence of the internal solution of the reference electrode, place the sleeve of the reference electrode lower than sensing part of the glass electrode, then stir the sample slowly. Stopper the sample container tightly with the lid to avoid exposing the sample to the air, and spray nitrogen to the sample solution level. Then, the influence of carbon dioxide in the air may be reduced. (1) Calibrate the glass electrode in the standard solution, and rinse it with pure water. (2) Fill the measuring container with the sample, and immerse the electrode for more than 10 minutes. (3) Rinse the measuring container and the electrode with new sample (different solution mentioned in (2) above). (4) Do not wipe the container and electrode of the cleaning liquid out with filter papers or tissue papers. Keep the container and electrode getting wet, fill the sample slowly into the container without bubbling, and measure the sample pH value. There are following electrodes for low conductivity water/non-aqueous solvents. #9630-10D: Quick and stable measurement is possible for low conductivity samples or those with low buffering ability, such as tap water. Suitable for water quality testing at water treatment plants. #6377-10D: This integrated electrode has good response to aqueous solutions in the low conductivity/low buffer capacity, and to non-aqueous solvents such as alcohol.